A new book by the author Jim Collins is out, and it's called Great by Choice - Uncertainty, chaos, and luck - why some companies thrive despite them all. The book is basically part 4 in a series of books on why some companies are different from other less good companies. I've used two of his earlier books: Good to great and The fall of the might, when I analyzed the rise and fall of the company Digg. The new book analyzes why some companies are surviving a state of chaos, such as the credit crunch of 2008, and spikes in the price of oil, while other companies perish under the same conditions. One thing we know for sure is that the chaos in the world will continue, as it always has, but how can you prepare yourself and company when the next chaotic event occurs? One example of a company that has endured misery in the period 1972 to 2002 is Southwest Airlines. The company began with three airplanes, and if you had invested $10,000 in the company in 1972, you would have had $12 million by the end of 2002. The return of the stock was 63 times better compared with the stock market. How did Southwest Airlines survive despite all the events that occurred during the period, including fuel shocks, strikes, recessions, terrorist attacks, when so many other airlines have struggled for their survival? "Victory awaits him who has everything in order - luck people call it. Defeat is certain for him who has neglected to take the necessary precautions in time - this is called bad luck." Amundsen arrived in December 1911, 34 days before his competitor the Brit Robert Falcon Scott. They were both of the same age, and had roughly the same experience, so why did Amundsen make it? The first big difference between the two was that Amundsen was better prepared. Amundsen took the bicycle from Norway to Spain just to practice how to survive, he lived like a shipwrecked even though he wasn't, he studied the maps and stories from previous expeditions, and he lived with Eskimos who knew how to survive in a rough environment. Scott on the other hand was a Royal Navy Officer and didn't practice in the same way. He decided to choose horses instead of dogs, he brought with him motor sledges that were untested. The result was that the horses died, and the motor sledges stopped working in the cold, so Scott had to drag his equipment by himself. Meanwhile, Amundsen's dogs were traveling at high speed toward the South Pole. Thanks to his studies of the maps and previous expeditions, Amundsen could find a more efficient way to the South Pole. Foreseeing unexpected events. 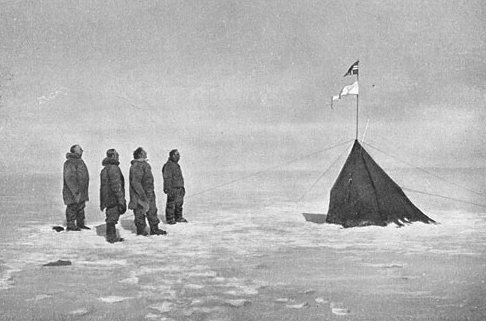 Before the race had begun, both team built supply depots on the way to the South Pole. 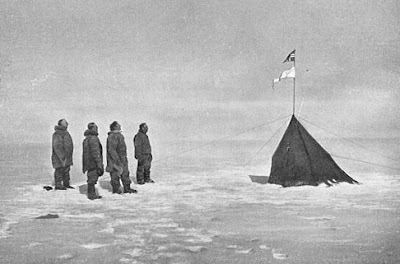 Amundsen decided to place black flags in a wide array around his supply depot, so he was sure that he wouldn't miss it if there was a storm. Scott on the other hand placed only one flag at his depot. Amundsen stored three tons of supplies for his five men and could survive if he missed a supply depot, while Scott stored one ton of supplies for his seventeen men and couldn't miss one of his supply depots. Amundsen brought four thermometers, while Scott brought only one and that one thermometer would eventually break. The 20 mile march. Each day, the goal of Amundsen was to travel a distance of between 15 and 20 miles (24-32 km). If the weather was bad, he tried to travel 20 miles, and if the weather was good, he traveled 20 miles and rested the rest of the day to regain his energy. Scott didn't have any goals at all. If the weather was good, he would go as far as possible until he was exhausted, and if the weather was bad, he would sit in his tent and wait for the good weather to come back.